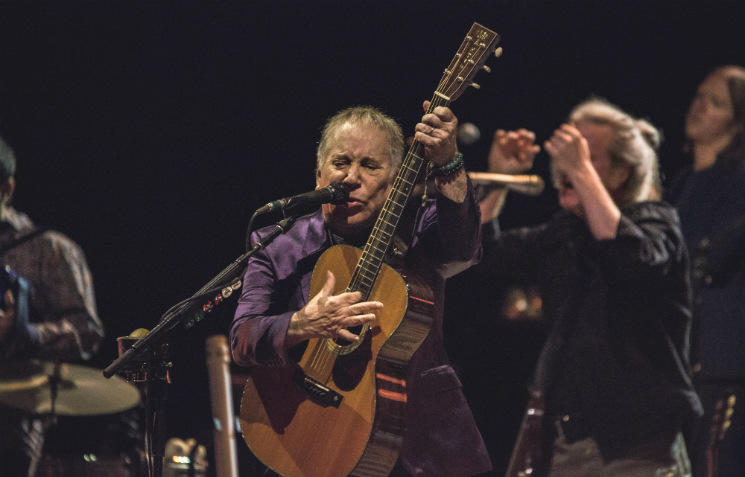 At an age where many of his contemporaries have long retired from the studio or the stage, faded into musical irrelevance, or worse, Paul Simon (who turns 75 in October) has lost little of his musical ambition or boyish voice. Hot on the heels of the release of the rhythmically adventurous, critically acclaimed Stranger to Stranger, Simon returned to the relatively intimate confines of Toronto's Sony Centre on the first night of summer for a typically generous 130-minute set that showcased both his rich catalogue of classics and his dazzling nine-piece band of multi-instrumentalists. Strolling matter-of-factly onto the stage during an instrumental version of "Proof," the singer kicked into Graceland's "The Boy in the Bubble," whose lyrics about the effects of technology and media overload — "The way the camera follows us in slo-mo / The way we look to us all" — sound as relevant today as they did three decades ago. Simon followed that opener with a subtly revamped "50 Ways to Leave Your Lover," which was enhanced by the addition of a funky horn arrangement in the chorus. Then, he dipped a toe into his post-millennial releases for the gentle, uplifting "Dazzling Blue," from 2011's So Beautiful or So What. A little jig to the opening chords of the accordion-led "That Was Your Mother" seemed to loosen up the singer, who spoke to the audience for the first time to playfully banter with a few effusive fans ("Run for President? Who would want to do that!") and introduce the acerbic "Rewrite" with a brief demonstration of his songwriting process. An elongated "Me and Julio Down by the Schoolyard" that provided plenty of space to showcase Simon's skilled backing band also drew the first standing ovation of the night, after which Simon paused to tell a long, caustic story about the encounter with a Brazilian healer (brujo) that inspired The Rhythm of the Saints' "Spirit Voices." Ostensibly touring behind his first studio album in five years, Simon waited until the second half of the main set to introduce the first of three selections from Stranger to Stranger (the title track) before quickly moving back in time ("That was a new song; here is an old song.") with Parsley, Sage, Rosemary and Thyme's "Homeward Bound." A slight touch of age in Simon's voice added a new dimension to the Simon & Garfunkel classic, and turning the song into a lilting shuffle both revealed its country undertones and emphasized the weariness of its lyrics. That post-comeback Elvis or Sinatra — or even Johnny Cash in his twilight years — never covered the song seems like a heartbreaking missed opportunity. While there were no great surprises in a setlist where non-singles from megahit LPs qualified as deep cuts (a transcendent "The Cool, Cool River" and an exuberant "I Know What I Know"), no one in the sold-out Sony Centre was complaining. "You Can Call Me Al" — complete with a literal spotlight on Bakhiti Kumalo's extraordinary bass parts — predictably brought the crowd to its feet, Andy Snitzer nailed Michael Brecker's long saxophone solo on "Still Crazy After All These Years," and the only other new songs — "The Werewolf" and "Wristband," a comical tale of a singer locked out of his own show that transforms in its last verse into a critique of political and economic inequalities — were both excellent. If Simon has famously — and successfully — incorporated everything from reggae rhythms and Afropop to electronic experiments with Brian Eno into his songcraft, what was perhaps most remarkable on the night — other than his band's astonishing musicianship — was how seamlessly the sounds travelled from New York, to New Orleans, to South Africa and back. A delicate, elegiac solo performance of "The Sound of Silence" — Simon & Garfunkel's first hit single — brought Simon full circle and closed the book on a thrilling journey through more than 50 years of American popular music.